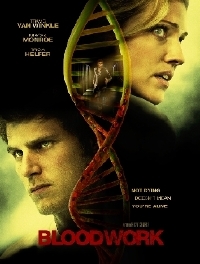 Tricia Helfer (BSG) lures college boys Travis Van Winkle and John Bregar into a dangerous new medical blood trial in this first trailer for Bloodwork (formerly "Phase One"). The film has recently landed a DVD distribution deal with Lightning Entertainment who is showing the film off at AFM this year. You can tell this trailer is an unpolished version for clients. The "instert company logo here" frames give that away. Best friends Greg and Rob, college roommates, decide to earn a little extra cash by participating in a two-week pharmaceutical test over the Christmas holidays. Locked into a remote hospital facility far out in the isolated countryside, they find themselves part of a bizarre series of tests. But as order and control start to break down, it becomes clear that drugs are having increasingly dangerous side effects, and that no one involved in the test will be safe for long. Eric Wostenberg directs the film written by David Nahmod.